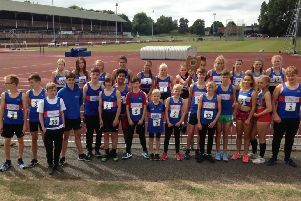 Euxton’s Holly Bradshaw has been confirmed in the Great Britain squad for next month’s European Championships in Berlin. The Blackburn Harrier won the British vole vault title in Birmingham with 4.60m a month ago, to qualify for the Euros. And her seat on the plane to Germany was confirmed when the 102-strong squad was unveiled last week. Bradshaw will be joined by Lucy Bryan and Molly Caudrey in the squad for the pole vault. She goes to Berlin with a season’s best of 4.80m set in Germany, in Jockrim earlier this month at the Internationales Stabhochsprung-Meeting, three days after a clearance of 4.75m won Britian’s first gold medal at the inaugural World Cup at the London Stadium. Bradshaw was fourth in the Commonwealth Games on the Gold Coast in Australia earlier this year, and will hope to win her first major outdoor medal at the Euros, which are held from August 6th-12th. Performance director Neil Black said: “The standard of performances from British athletes since the Commonwealth Games in April has been extremely high and competition for places to Berlin has been more competitive than ever. “This is a huge opportunity for athletes to demonstrate form ahead of two global championship summers. “The team is our largest for over 100 years and we look forward to watching them thrive. For the first time at a major championships there are more women (56) selected than men (46).